Spectrum Pool Care to the rescue! That also helps them to be more able to diagnose any problems that arise with your water, wince they'll be familiar with your pool and your city's water. That's why it's important to have a trusted company that you can rely upon to perform repairs on your pool's equipment, whether your pump is broken, you have burned out lights, or if you have bigger problems like a malfunctioning automation system. We can even help you discuss alternatives to standard chlorination, like salt water or saline systems and ozone and ultraviolet. When you call us for a free estimate, whether you need weekly routine cleaning and maintenance, or if you have more specific issues, we'll come right out to your home to take a look at your water. You've got to maintain the water, checking chlorination and pH levels, and you've absolutely got to keep it clean, which means skimming the surface, keeping debris out of the deeper areas, and washing the tiles. No matter what you need, we offer fast, reliable services at prices that you can afford. You'll also benefit from our over twenty years of cleaning and maintaining swimming pools in the Los Angeles area and the San Fernando Valley. Another thing we'd be happy to discuss with you is alternatives to standard chlorine, such as chlorination systems using saltwater or ozone. In business now for 27 years, Spectrum has broadened its territory to reach more and more clients. We are now servicing the beach community offering technical labor to support various swimming pool and water feature requirements. Spa and hot tub service is a recent addition with our newest team member we are proud to have. When a repair is urgent, a professional with plenty of in-field diagnostic experience is helpful to find the cause of the system failure. Correlation does not necessarily mean causation; patience and time-honored education provides the difference. We are proud of the skilled personnel on our staff, and continue to educate. When arriving home on a hot day, your swimming pool becomes a refuge to reawaken your appreciation for living in Santa Monica. When pool chores are required however, it's time to pick up the phone and call your local Los Angeles pool cleaning company for a reprieve from any further work. Spectrum will handle all your swimming pool needs from supplies or service, to technical consultation. Weekly swimming pool maintenance is now offered in the beach cities of Santa Monica by Spectrum Pool Care, a local San Fernando Valley pool maintenance company who has over twenty-two years of attentive pool experience and many satisfied clients. 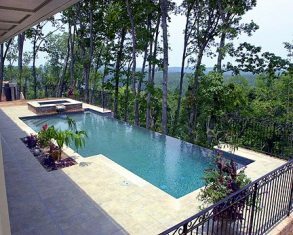 We promote salt water pools and are available for free phone consultation. Progressive approaches for swimming pool management have focused on the dispersal of minerals as an algae-eradicating solution. This approach is combined with a sanitizer in a complementary process to keep unwanted pathogens and algae from forming. Pool service companies are now getting up to speed with these applications, and Spectrum Pool Care has made it a priority to become knowledgable in this area. After all, who wants to have to worry about skimming the surface, removing the bugs and leaves and other debris, changing the filters, backwashing the filtration system, checking the chlorine, maintaining the pH levels, and ensuring that all the equipment is working? It's a laundry list of worries that would be well left to someone else. If your equipment would benefit from being repaired we'll do it, and if it's older and inefficient, we can upgrade it to the newer energy efficient models being manufactured today. However, what we sometimes forget about swimming pools is the maintenance and cleaning that they require in order to remain beautiful. We also are able to repair any equipment that malfunctions, such as heaters, motors, chlorinators and lights, and we can even help you update any older, outdated equipment to the newer models that save on energy. This is probably why so many homeowners in the Los Angeles area do have pools and take advantage of them regularly. Southern California is an area of the nation that is renowned for its sunny, warm days. Not only do you have to check and maintain the chlorine and acid levels to ensure that the water stays clean, but you've also got to skim the surface and remove any debris like bugs or leaves. Alternative sanitization is something to consider if you are inclined towards green technology. The essence of chemical maintenance is to provide a safe and comfortable swimming environment that does not cause progressive damage to the pool equipment and structure. Minerals, Ozone, and Chlorine Generators are top choices for residential application. There are many manufacturers who provide the service industry with appliances that sit on the equipment pad - but few who take the lead. When considering an upgrade or repair, always inquire about the latest in technological advances. We do the research daily and can therefore be of help. Whether it is heating your water or sanitizing, there are many options available. Cleaning a pool is no small matter. It takes persistance and self-discipline to come back each week and face a new round of challenges. Sometimes the dirt is layered on the bottom of the plaster, and other times leaves are floating on the surface. Be sure to utilize the best tools available to insure proper maintenance - we do this daily. That's where Spectrum Pool Care comes in - with over twenty-two years of experience working on and cleaning swimming pools in the San Fernando Valley, we offer a great alternative to doing the maintenance yourself on your own pool. Finding a pool cleaning service that you can trust to come to your home regularly and maintain your pool's water can be difficult - there are so many options out there. Hiring a service like Spectrum Pool Care to clean your swimming pool is money well spent, especially since we pride ourselves on offering top quality care and service at more than affordable prices. We offer free estimates for our weekly services as well as more specialized services, such as installing energy saving pumps, remote control systems, algae elimination, and repair of your heaters, pumps and lights. We are fully licensed and insured, and Certified by the Los Angeles County Health Department. While we're out there we can also give you an estimate on replacing the unit or any other outdated equipment with the newer systems that are more energy efficient and will actually save you money in the long run. We are a trusted resource, known not only for reliability and professionalism, but also affordability. Please don't hesitate to contact us as we have a full-time knowledgeabe staff. Just give us a call and we'll come out to your home and take a look at your problem equipment. Maintaining and cleaning your swimming pool can be a real hassle if you're trying to do it on your own. We are a local Los Angeles Pool Service company ready to serve you. We also will give you the information you need. Spectrum Pool Care has been offering weekly cleaning and maintenance to poolowners all across the San Fernando Valley for more than twenty years. Often your pool's water heat will be lost over the course of these chilly nights, which is why so many pools in the area are heated. Of course there are the chlorine and pH levels that have to be maintained, and the equipment has to be taken care of to ensure that it will keep your pool running in good order. One of the best things about living in Los Angeles is the weather - it's sunny all the time, has one of the longest warm seasons in the nation, and the climate is moderate. The area boasts one of the longest warm seasons in the nation, which means you get to enjoy the sun nearly year round, and it is actually warm enough to swim in those fringe months on the edges of early Spring and late Fall. Having fun by splashing and jumping in a pool is what kids remember about swimming the long summers away. The water is refreshing and exciting - a day can go by poolside with boundless energy and feel great at the end. But what culminates in clear and healthy water requires an optimal motor, filtration, heat, and chems interplay. The most important human element is rigor and discipline by pros who scrub the walls, empty baskets and test the water. Hire a capable technician for best results. Spectrum pool and spa repair technicians have the training and education with many years feild experience offer informative consulation and resolution to pressing repair issues. Ask about the newest in technology to improve water circulation and clarity, as well as save dollars with energy improved lights and pumps. When the sun is shining and you want to cool off and get a retreat from the heat, it is wonderful to have a shimmering body of water to have fun and refreshment in. That is achieved by having proper care and maintenance each week to insure that all the chemicals are in balance, the walls are brushed and pool vacuumed. Affordable weekly pool care need not break the bank, however a prudent and professional company will be charging fees commensurate with quality maintenance. That is because licenses, training, certification, and insurance - as well as being properly equipped with tools and an appropriate quantity of chemicals are included. Safety if a concern for any pool or spa owner if they have children or pets. Fencing is an option to consider as an aesthetic appeal can be maintained with the latest in design fabrics and materials. There are other things an owner can do to protect their loved ones including anti-entrapment main drain covers and converting the circulation system to a variable speed pump running on low the majority of the day. Owning a swimming pool can be a great aid to rest and relaxation in your home, but it also has the potential to create increased stress. Just give us a call and we'll come out and give you an estimate, whether you need simple routine maintenance and cleaning, or if you have more complicated issues such as water clarity and algae problems, malfunctioning or outdated heaters, pumps, filters and lights, or even if you are considering making the change from standard chlorination to systems that employ salt water, ozone and ultraviolet. Let our experience make maintaining your pool that much easier, whether you need to have your autocleaner fixed, or if you have outdated equipment that would benefit from an update to newer models. In our twenty years of serving the Los Angeles area poolowners we have also repaired equipment like filters, motors, chlorinators and lights, and we've updated older pools' equipment with the newer models that are energy efficient. We know how much those swimming pools cost - we don't think you ought to have to empty your pockets just to keep them up and running. It can almost overwhelm the pleasure you get from enjoying the water, but you've absolutely got to do it to keep your pool safe for swimming. Swimming pools can add a lot to your home - not only property value, but the value that comes from having a pristine blue, shimmering oasis in your back yard ideal for rest and relaxation with the benefit of the privacy of your own home. Spectrum Pool Care is a pool maintenance company serving Los Angeles County and the suburbs of Valley Village, Encino and Burbank at reasonable costs. Thus, most of these ubiquitous swimming pools are equipped with a circulation system. But what if you have to spend all your time cleaning and maintaining them? After all, there's a veritable laundry list of things that have to be taken care of - skim the surface, remove leaves, grass and debris, wash the tiles and walls, change the filters, check and balance the chlorine and pH levels, backwash the filtration system, and maintain all of the equipment. Just give us a call, no matter your problem. Cleaning and maintaining the swimming pool is that hidden downside that we often forget about when we're thinking about purchasing one for our homes. Just give us a call and we'll be happy to come out to your home and give you an estimate for your repair. We can also consult with you about switching to alternate chlorination like saltwater and ozone. That's why it's important to have a service you can trust that will come out and perform routine maintenance. We are a Los Angeles swimming pool service company with more than twenty years of experience providing top notch pool service that's not only reliable and professional but is also, most importantly, affordable, to poolowners in North Hollywood, Canoga Park, Van Nuys and Sherman Oaks. We know how much it costs to install a swimming pool, and that's why we provide reliable, professional and affordable repair services for pool circulation equipment. Have you got algae-ridden water or a plumbing that leaks? Maybe you just have broken tiles or a pump that's no longer pumping. We offer services to Studio City, North Hollywood and West Hills poolowners. After all, the long warm season means that the weather stays sunny much longer than in other parts of the nation. For example, when you hire Spectrum Pool Care to come out and provide weekly routine service, you get a number of benefits. That's when it's important to have a trusted, reliable company who can come out and fix it for you. Best of all, when you hire Spectrum to take care of your weekly maintenance, you're actually getting more for your money, since we not only provide routine cleaning services like changing filters and occasional backwashing, but we are also able to repair malfunctioning equipment, so you won't be stuck in early spring or late fall with a broken heater and cold water. Of course, it's important to make sure you hire a reliable company to perform your repairs for you. If you want to spend more time relaxing in yours than skimming, cleaning and maintaining it, then it would benefit you to hire a pool care and maintenance service. When you call us to come prepare an estimate, chances are that the company owners will be the ones who arrive at your home, and you'll also likely see the same technician each week, since we work with only a select group of technicians chosen for their skills and professionalism. Add to that equipment maintenance - you have to ensure that your chlorinator, motor, heater, pumps and filtration system are all working properly. We are a local Los Angeles pool maintenance company with more than twenty years of providing top notch weekly cleaning and maintenance to poolowners all across the valley. We specialize in providing reliable, professional, affordable service. Southern California is known for its sunny days and incredibly long warm season. No matter what you need - weekly services or equipment repair on your malfunctioning heater, chlorinator or filtration system - we'll be happy to provide you with a quote - just give us a call. Enter Spectrum Pool Care. No matter what you need, trust that with Spectrum, you'll receive quality service and repair at reasonable prices. Trust us to do your cleaning and maintenance and start taking advantage of the rest and relaxation that your pool offers. In fact, you're likely to have the same technicians each week, allowing you to become familiar with them and them to become familiar with your pool and water.